“Your favourite colour is blue, isn’t it?” I asked my child. “There’s a famous painter who used to paint people’s faces blue. Would you like to go and see?” I’d expected an eye-rolling-heavenwards Nice-Try-Mummy reply but to my astonished delight I got a wide-eyed “Oh, I’d LOVE to!” Oh my sweet boy. And so it was I found myself skidding through the South African National Gallery, straight past two fascinating-looking photographic exhibitions: The Indian in Drum Magazine in the 1950s and Ranjith Kally: Through the Lens of Durban’s Veteran Photographer, to the five rooms dedicated to one of South Africa’s most controversial artists. This is the first major retrospective of Tretchikoff’s work from 1940s-1970s. 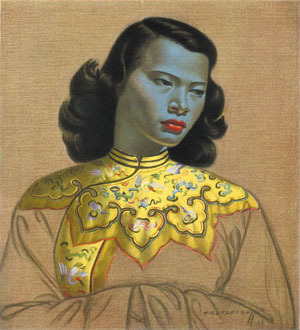 His blue tinged Chinese Girl (1952) is the pin-up girl of the exhibition and a firm fixture in popular culture. The first artist to pioneer the idea of affordable prints for the less well-off, Tretchikoff died a rich man in 2006. His art, however, is not loved by all and certainly its popularity swells and wanes with culture’s love/hate relationship of kitsch. Personally I found his paintings of animals and flowers to be easily missable, though Joseph loved the blurred movement of the racehorses. While most of Tretchikoff’s work is super realism, he clearly always had an urge to experiment, to try a new effect. Whether it worked or not is of course subjective. Joseph was also struck by the series of paintings of the Ten Commandments which he had recently learned about at school. Pausing for all of five seconds before each of them, I reeled off the titles “You must not steal”, “You must not kill”, “You must always be nice to Mummy and Daddy”, pausing only momentarily before the naked lady writhing across the canvas before opting weakly for “You should always be nice to the girl you marry”. I made a mental note to ask his teacher how she had approached ‘Thou shalt not commit adultery’. The clear highlights were the portraits, both for me and for Joseph. He loved picking out the blue highlights of the skin and seeing how the red of the lips might be the same colour as her hat or as a flower on her dress. He found all “the booby ones” fairly dull, rather to my relief considering his fascination with the ones he’d once seen – and loudly commented on – in the ladies’ changing room at the swimming pool. Hair was also of interest, particularly in Boy with Melon, where the grinning boy’s short bobbly hair is reproduced with blobs of dark oil. The fact that I could have stood and gazed for a hundred times longer than the average attention span of a five year old is irrelevant. At just R 20 entrance fee I can always go again, and as it was I thoroughly enjoyed myself. And I wasn’t the only one there with a child in tow, combining a quick blast of art with squirrel feeding in Company Gardens and a run around of the dinosaur section of the next door South African Museum. The full title of the exhibition is Tretchikoff: The People’s Painter. Well named. Whatever hat you are wearing – middle-of-the-road critic, over-excited child or under-slept mother you’ll find something to enjoy here. Even if it’s just because you like blue.